The sloe gin fizz is a popular fruit cooler and a wonderful way to enjoy the sweet taste of a great sloe gin. 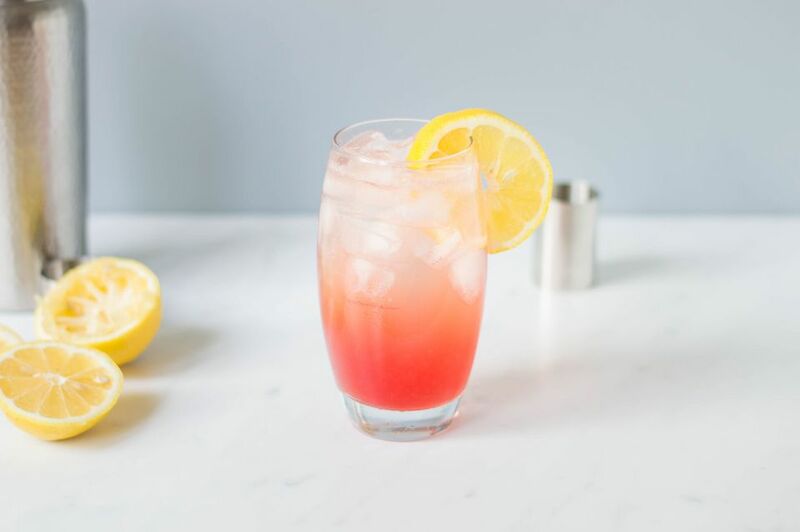 This drink is easy to mix up and it is a nice cocktail for summer and spring days on the patio. There is no one-size-fits-all recipe for a sloe gin fizz. You can adapt it to your individual taste or for a particular sloe gin. The base recipe splits sloe gin with regular gin. If you have one of the well-crafted sloe gins (or your homemade favorite), you may want to skip the ​London dry gin completely. It is the perfect introductory cocktail for the sweet taste of sloe gin, which is seeing a comeback and used in a number of classic cocktails. Pour the sloe gin, gin, lemon juice, and simple syrup into a cocktail shaker filled with ice. You will find many different recipes for a sloe gin fizz. The majority of the variances depend on personal taste and it might be best to give a few a try to see which you enjoy best. As you experiment with different sloe gins, you also might find that some of these work better than others. Use a sour mix rather than lemon juice and simple syrup. Skip the gin and pour a full shot of sloe gin (particularly if you have a quality sloe gin). Adjust the simple syrup to fit your taste and the sloe gin you're using. Split the soda, filling halfway with plain soda and the rest with lemon-lime soda. Skip the sweetener altogether or use granulated sugar rather than simple syrup. How Strong Is the Sloe Gin Fizz? To make the sloe gin fizz the fruity highball that it should be, you will probably pour 3 to 4 ounces of soda water to fill the glass. With the average sloe gin and an 80-proof gin, this cocktail is a very smooth drink at a mild 10 percent ABV (20 proof). Despite its name, sloe gin is not a gin. It is a red liqueur made with sloes, a type of berry from the sloe (or blackthorn) bush. The sloe is a blue-black fruit which is a type of plum and can look like a cross between that and a blueberry. The sloe has a very tart taste and it's not recommended to eat them raw. Instead, they are best enjoyed as an ingredient alongside a sweetener to contrast the tartness. This is why they're so popular in jams, preserves and, of course, sloe gin. Sloe gin will often have a gin or vodka base and is sweetened with sugar. It also is easy to make your own sloe gin if you have access to the fruit. The plant is plentiful in the hedgerows of England. That is why English sloe gins are so popular and homemade sloe gin is integral to British cuisine. A renewed worldwide interest in sloe gin has made a significant difference in the quality of commercially produced sloe gins. Much of this began when Plymouth Gin decided to revive a traditional recipe using real sloes. It is one of the best and most readily available sloe gins to be found today. More distillers have caught on to the sloe gin revolution. Brands like Hayman's, Bramley & Gage, Gordon's, and Sipsmith have very impressive sloe gins as well. You might want to steer clear of cheaper brands like DeKuyper and Paramount. Many of these do not use the most natural of ingredients. A couple of decades ago, it was necessary to buy these unless you made your own. Luckily, you have better options today. You will find that some sloe gins note "creamy topped" on the label. When shaken, there will be a creamy head on top of these sloe gins. The effect is similar to the foam of an egg cocktail and why the sloe gin fizz doesn't require the egg found in the popular gin fizz. Patxaran is a Spanish liqueur similar to sloe gin that also is made with sloes. It will vary, but most sloe gins are around 26 percent alcohol by volume (52 proof). Sloe gin is not one of the most common ingredients in the bar, but it does make an occasional appearance. It is most famous for the sloe gin fizz and the sloe screw. The latter has countless variations that add an ingredient or two. Bartenders also had some fun with the names: the "sloe screw against the wall" adds a Galliano float like we see in the Harvey wallbanger. You may notice that some of these cocktails and shots are pretty popular. Many of these were created when sloe gin peaked during the 1970s and 1980s. This includes the likes of the Alabama slammer cocktail, as well as shooters like the Alabama slammer and Kool-Aid. The pink flamingo and purple Viking also come from this era. While those are fun and a bit quirky, sloe gin also has a place in classier drinks. Some of these are classic cocktails from the early 20th century. You have the apricot brandy and rum delight called the millionaire cocktail and the San Francisco cocktail, which gives sloe gin more of a "real martini" treatment. The Charlie Chaplin was a hit in the 1910s and 1920s at the Waldorf-Astoria and it's long remained a favorite sloe gin drink. Rather recently, some crafty mixologists created a companion cocktail, the Lita Grey. This modern Champagne drink has a classic style and is named after Chaplin's teenage bride. You cannot discuss sloe gin without mentioning the flaming Homer or "flaming Moe," if you prefer. It's a strange drink created on "The Simpsons " and is one of those oddities that is probably best left in the world of cartoons. No matter how you choose to mix sloe gin, it's certainly a spirit worth checking out. There's a good reason why it's seen waves of popularity over the last century. One might even say that you can take a "sloe" trip through time with a few good sloe gin cocktails.